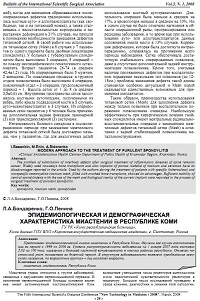 The epidemiological analysis of myasthenia in Komi Republic was submitted. All cases of hospitalization for the period with 1998 on 2006 are investigated. The level ofprevalence of disease for January, 1, 2007 has made 5,03 on 100 thousand population with the greater frequency of occurrence in southern areas of republic. Constant growth of a parameter for the 6-years period is marked. In structure of disease the prevalence of the female, and the persons of young age is revealed. Ишмухаметова А.Т., Мусин Р.Г., Хидиятова И.М., Магжа- нов Р.В.Эпидемиологическое исследование миастении гравис в Республике Башкартостан.// Неврологический журнал. - 2006. - №11 - С. 16-21. Мальмберг С.А. Миастения и миастенические синдромы. В кн: Болезни нервной системы. Под ред. Н.Н.Яхно. - М.:Медицина, 2005. Aiello I., Pastorino M., Sotgiu S. et al. Epidemiologi of myasthenia gravis in northwestern Sardinia // Neuroepidemiology. - 1997. - Vol. 16, N 4. - P.199-206. Phillips L. H., Torner J. C. Epidemiolodic evidence for a changing natural history of myasthenia gravis // Neurology. - 1996. - Vol.47. - P. 1233-1238.